This is a small sample of my task card collection. 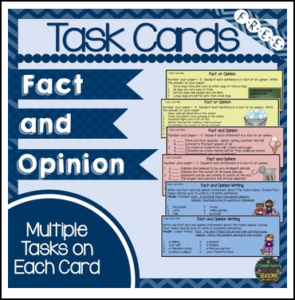 These differentiated task cards are larger than normal (8 questions each) so students can work on just one card. More advanced students may complete more than one card. There are multiple tasks on each card. Great for literacy centers, early finishers, the Daily Five and small group intervention! A “user friendly” method of displaying them is to laminate them, punch a hole in the corner and attach them with a binder ring. a loose leaf binder ring.